One of the reasons that solid surface countertops are so popular with homeowners today is because the countertops are easy to care for and maintain in good condition for many years. Although the maintenance recommended to preserve the countertop in top condition is minimal, some maintenance will need to be performed to keep the countertop looking its best. There are certain things that will need to be done on a regular basis and some things that should never be done to a solid surface countertop in order to keep the countertop in good condition and looking new for a long period of time. The most important part of solid surface countertop maintenance and care is to keep the countertop clean. Keeping the countertop clean provides many benefits including inhibiting the growth of mold and bacteria, preventing stains, and reducing the amount of maintenance that you will need to perform on the countertop at a later date. Solid surface countertops are easily cleaned with a simple solution of soap and water applied with a sponge or a soft rag. Many chemical cleaning solutions are not recommended for cleaning solid surface countertops because these solutions can destroy the finish of the countertop, resulting in the need for the total replacement of the countertop surface. Because of the material that the solid surface countertops are made from, the chemical components in the harsh cleansers can actually melt the countertop material causing irreparable damage that is very difficult to hide. Some chemical cleaning solutions can also discolor the surface of the countertop causing patches of darker or lighter colors in the otherwise uniform countertop surface. If something has dried to the surface of the countertop and is difficult to remove with a sponge or soft cloth, it is not recommended to use a scrubber or abrasive item to attempt to clean the countertop surface because it could result in scratches and damage to the countertop surface. If an item is proving difficult to remove from the surface of the countertop, try placing a hot damp sponge on top of the spot and leaving it for 10 to 20 minutes to allow the steam and moisture from the sponge to release the spot from the surface of the countertop. 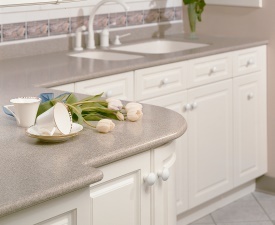 Solid surface countertops are created from a hard plastic material making it nearly impervious to cuts and gouges from sharp objects, although the surface of the countertop can be scratched by some abrasive materials. The plastics used in the countertops are not heat resistant, so placing hot items on the surface of the countertop can result in visible burns and melted areas depending on the temperature of the item placed on the countertop. If burns occur, they are very difficult, if not impossible, to repair and the damage often cannot be hidden, which means that the homeowner may have to replace the entire countertop if they want a countertop with an attractive appearance.